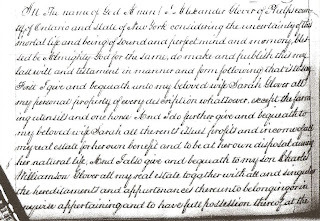 My new found 'Glover' cousin shared Alexander Glover's will with me. 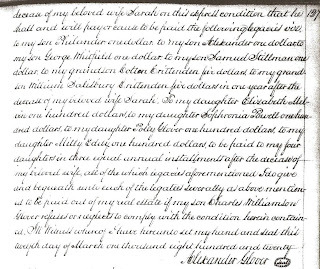 Alexander Glover is my paternal 4x great grandfather (Alexander, Samuel S., Samuel S., Jr, Frank, Harry, Bruce, Me) First of all I would like to thank Jared Willson, Esquire, for his superb handwriting. 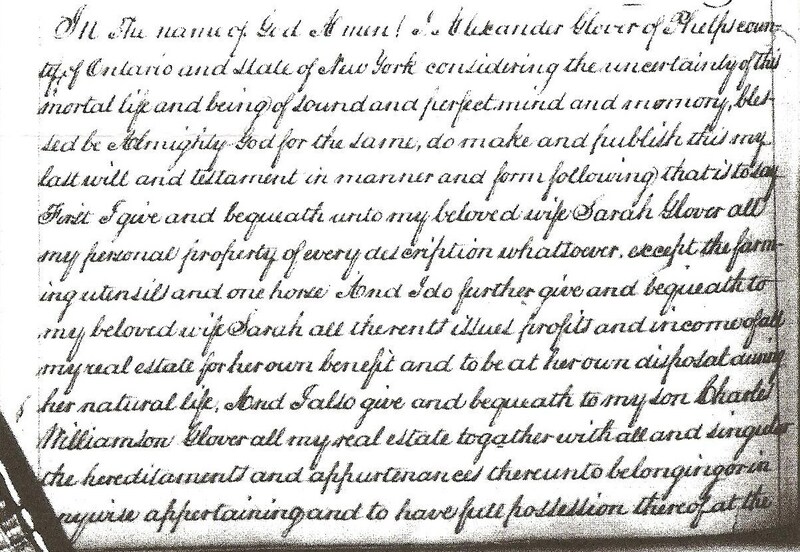 This is one of the easiest to read wills I have seen. Alexander's belief in God and love of his wife, Sarah was evident in his will. I have found 12 children born to Alexander and Sarah (Salisbury) Glover: Philander, Sarah, Elizabeth, Alexander, Sophronia, Rachel, George Whitfield, Charles Williamson, Samuel Stillman, Polly, Amelia, and William Salisbury. 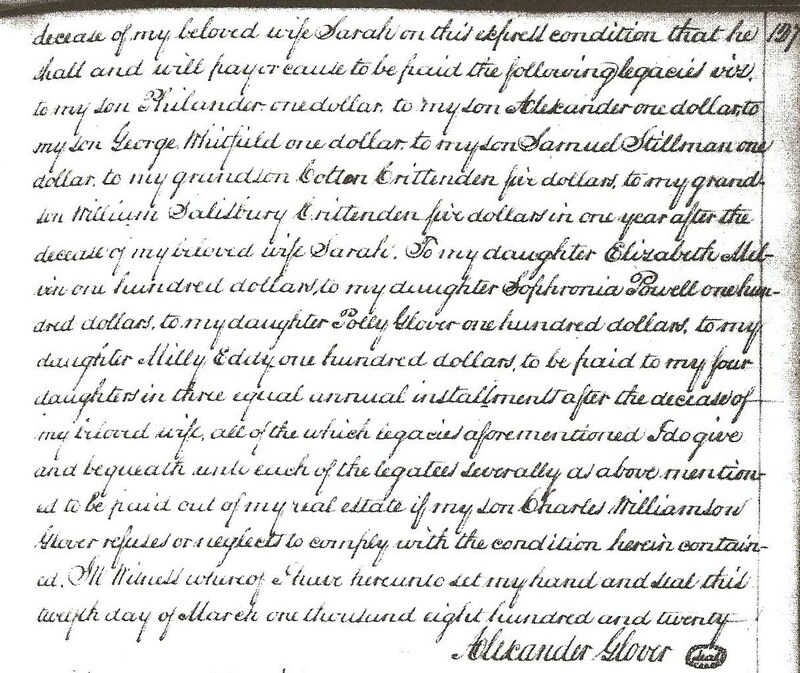 Alexander's will lists nine children. The three not mentioned are Sarah, Rachel, and William Salisbury. I know that William Salisbury Glover died at the age of 1. I have often wondered about the middle names of the children in my Glover family. A few times I have found surnames as middle names, I wonder how many of Alexander's children's middle names have clues in them. I agree that the handwriting it elegant, do you know if he wrote it or a lawyer did. I know Alexander didn't write it as other wills before his and after were in the same writing. I thought the lawyer must have written it, or maybe an associate of his. Sarah S Glover Crittenden died 15 Dec 1812 and is buried in Joslyn aka Oaks Corners Cem. I suspect that Rachel died young but I've yet to find any record of that. Interesting to me was that fourth son, Charles, was left the majority of the estate. Thanks Apple for the info on Sarah. I wondered about Charles getting everything also. The writing is beautiful, and it is one will that is a joy to read. I think middle names hold clues, that is what I have to believe for my own unsolved lines. Thank you and our Glover cousin for sharing your family documents and photos, it is truly a thrill to find these treasures! My ggg-grandfather was George Whitfield Glover; the three brothers that were to receive one dollar all moved to Michigan. The date on the will is 1820, I know my line of the family was in Michigan in 1833. I am always curious as to WHY people did what they did. Perhaps Alexander felt that Charles was the best choice for the responsibility of caring for Sarah. Did the elder sons leave because of the will or would they have gone anyway? Dear 'Cousin' Dawn, thank you for commenting. One of the things I enjoy most in my blogging is coming in contact with other Glover descendents. I wonder if Alexander had already given something to the sons that got $1. The earliest that I know of Samuel, my ancestor, coming to Michigan was between 1833 and 1840. I wonder if they all came at the same time. Of course, Samuel left a young family in Michigan and went back to New York after his wife died, in 1847. I would love to know the story there. 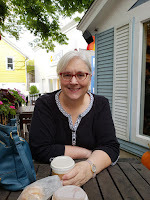 Feel free to contact me at brae957atgmail.com, I love to share info.